ACCRA — President Akufo-Addo has reiterated the commitment of the Government to creating a safe and secure cyber society for the country. Speaking at the 2018 National Cybersecurity Awareness Month event, on Monday, 22nd October 2018, at the Kofi Annan International Peacekeeping Training Centre (KAIPTC), President Akufo-Addo noted that whilst his Government is putting in place measures to digitize Ghana’s economy, it is also mindful of the dark side of digitization. With 10 million Ghanaians connected to the internet, of which 4.9 million are Facebook users alone, the impact of any cyber attack on the nation’s e-business platforms or on mobile telephony, he said, would impact negatively on businesses and on the lives of Ghanaians. As a result, President Akufo-Addo noted that Government is increasing efforts at increasing public sensitization, capacity building and investment in a fit-for-purpose cybersecurity infrastructure, to help make the country’s digital experience safe and secure. As part of measures to make the country’s digital experience safe, the President, later on, Monday, launched the Computer Emergency Response Team (CERT) for the telecommunications sector to coordinate incident response within that sector. Whilst congratulating the Minister for Communications, Hon. 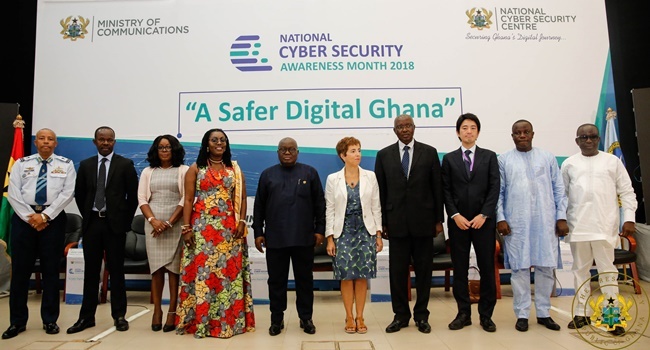 Ursula Owusu-Ekuful, MP, and the members of the National Cyber Security Inter-Ministerial Advisory Council (NCSIAC), for the establishment of the National Cyber Security Centre, to coordinate cybersecurity activities in the country, he was also hopeful that the National Cyber Security Policy and Strategy (NCSPS), which is currently being revised, would be concluded before the end of the year.